Overlooking the sitting area from the upper floor of the luxury Fairmont Royal York Hotel in Toronto, Ontario where you are surrounded by the stunning decor. The rooms, business center and restaurants are all designed as beautifully as the lobby and foyer and you are treated as royalty while staying at this luxury hotel in Toronto, Ontario. 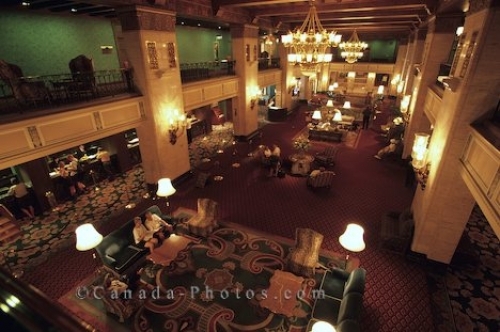 Picture of the lobby and foyer of the luxury Fairmont Royal York Hotel in Toronto, Ontario.